Steve McQueen: Portrait of an American Rebel, by Marshall Terrill (1993) TO ORDER THIS BOOK FROM AMAZON.COM, CLICK HERE. My Husband, My Friend, by Neil McQueen Toffel (1986) TO ORDER FROM AMAZON.COM, CLICK HERE. McQueen, by William F. Nolan (1984) TO ORDER FROM AMAZON.COM, CLICK HERE. Steve McQueen: The Pocket Essential, by Richard Luck (2000)TO ORDER FROM AMAZON.COM, CLICK HERE. McQueen: The Untold Story of a Bad Boy in Hollywood, by Penina Spiegel (1986) TO ORDER FROM AMAZON.COM, CLICK HERE. Steve McQueen, The Final Chapter, by Ragsdale Grady (1983) TO ORDER FROM AMAZON.COM, CLICK HERE. 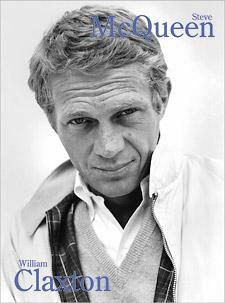 Steve McQueen, The Unauthorized Biography, by Malachy McCoy (1975) TO ORDER FROM AMAZON.COM, CLICK HERE. Steve McQueen: Star On Wheels, William F. Nolan (1972) TO ORDER FROM AMAZON.COM, CLICK HERE. The Films of Steve McQueen, by Joanna Campbell (1978) TO ORDER FROM AMAZON.COM, CLICK HERE. The Complete Films of Steve McQueen, by Casey St. Charnez (1984) TO ORDER FROM AMAZON.COM, CLICK HERE. Steve McQueen William Claxton. 9"x12". 176 Pages. 100 Duotone and 20 four color plates. (ISBN:1-892041-37-5) $60.00. *From Arena Editions Website located at arenaeditions.com . Bentley Publishers announces the publication and availability of ex-racer and acclaimed motor sports photographer and author Michael Keyser's "A French Kiss with Death: Steve McQueen and the Making of LeMans: The Man, The Race, The Cars, The Movie." This exciting new hardcover book from Bentley is part celebrity biography, part motor sports and part movie making. There is also a comic book, the third in a very popular Belgian comic book series titled "Dossier Michel Vaillant" by Denis Asselberghs and Jean Graton. 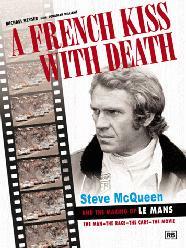 This book focuses on Steve McQueen and his obsession for racing. It contains many rare pictures of Steve McQueen racing both cars and motorcycles with comic drawings dealing with events from McQueen's life as well as the cars used in his films. Below is a picture of the cover. The Cooler King, by Dwayne Epstein. Fujico Miller (illustrator). Artesian Press; ISBN: 1586590618; (November 2000). This is a fiction book for school kids where Steve McQueen plays a very central role in the story. The book is part of series of books to help at-risk students learn how to read. TO ORDER FROM AMAZON.COM, CLICK HERE! 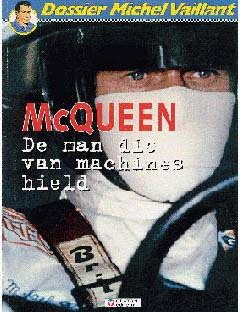 1 - McQueen - The Hero. (isbn 4-8261-0080-9 c0074 p2060e) This is a Japanese book in Japanese. Here we find many photos (color+b&w) of Steve taken from his films. 2 - Steve McQueen. (isbn 4-8261-0009-4 c0074 p1950e) The same kind of book as #1. 3 - Steve McQueen. (isbn 4-8261-1002-2 c0074 p1540e) Similar to #1 but b&w photos only. 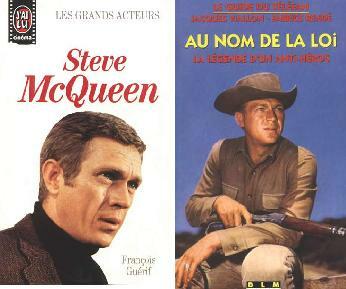 4 - Steve McQueen. (isbn 2.85336.067.9) AFrench book by Francois Guerif collection "tetes d'affiche" editor : PAC this a book about his films and his life with some b&w photos. 5 - Steve McQueen. A French book by Francois Guerif collection "les grands acteurs" editor : j'ai lu cinema similar to #4. 6 - Au Nom De La Loi : La Legende d'un Anti-Heros. (isbn 2-87795-085-9) In French by Jacques Viallon & Fabrice Rende DLM editions this is a book about "Wanted: Dead or Alive" giving a general description of it plus a precise description of each episode (topic+casting). There are many books on McQueen, and all are very good. Steve McQueen: Portrait of an American Rebel, by Marshall Terril, seems to be one of the best, although each book contains information unique to itself. Not one to socialize with the Hollywood crowd, Steve asked Pat Johnson and his wife, along with a then unknown Chuck Norris and his wife, to attend an event with him and Ali. "Everybody who was anybody in Hollywood was there," remembers Johnson. It was a black tie affair, but McQueen showed up in a plaid Benetton lumberjack shirt, blue jeans, boots, and a long beard. Not once during the event did McQueen get up. Instead, everybody in the room came over to greet him like he was royalty. Says Pat Johnson, "The cream of the crop from Hollywood came over to Steve to shake his hand. Clint Eastwood, John Lennon... all came over to the table. It was like they were paying homage to him. They were all in awe of him. He was not in awe of anybody."